Next week at this time we will have completed our first walk of the WalkIslay Islay Walking Week 2007. Hopefully I'll be enjoying a nice pint of Islay Ale with my dinner, later to be followed by a wee dram of Islay Single Malt Whisky. So how's my preparation going? 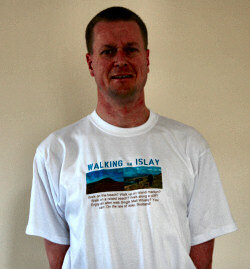 This morning I had a haircut, with all the digital cameras around nowadays I need to look good ;-) My Walking On Islay T-Shirt has arrived and as promised I'm modelling it today. I had my car serviced today to make sure it's ready for the long drive from Swindon to Islay. Weather permitting I'm planning to drive to Wales on Sunday for some walking practice. I've pretty much selected the walks I'm planning to go on, see my WalkIslay 2007 programme for details (also check the Islay Walking Week 2007 Updates for some latest news). Looks pretty good I think, still a few things to finalise and start the packing, but I'm getting there. How about you? Are you coming to Islay? Are you ready for the walks? Will I meet you on Islay?